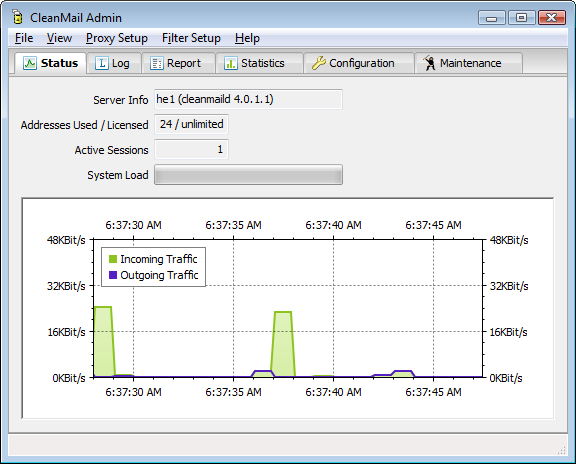 CleanMail Email Security & Anti-Spam Filter works with any existing mail server like Microsoft Exchange, Lotus Notes/Domino, IMail and is available as an installable software product for Windows and Linux/i386, or as a zero-maintenance hosted service (requires a MX redirect in the DNS record of your domain). CleanMail's transparent proxy architecture was designed to make the integration into existing e-mail environments easy and straight-forward. CleanMail Server allows you to configure an unlimited number of SMTP/POP3 proxy ports or POP3 connectors (full multi-domain support). CleanMail Email Security Server can be installed on your existing mail server and does not require additional hardware. Available for all Windows versions and Linux/i386. Supports all versions of Microsoft Exchange and Windows Small Business Server (SBS). 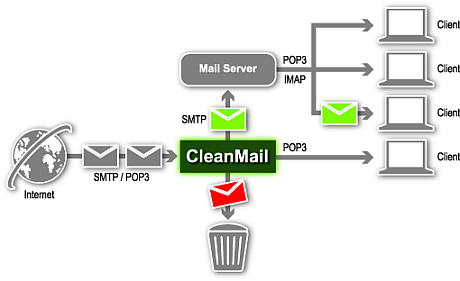 CleanMail Server can either be installed on separate hardware or on the same machine as your current SMTP/POP3 mail server. It works with any SMTP or POP3 mail server or POP3-to-SMTP connector. All filters allow to choose what happens with a mail if the filter finds unwanted content, such as a virus, or spam. accept/deliver (check disabled): A filter returns this result if the filter has been disabled for all recipients of a message. accept/deliver: The filter did not find unwanted content. accept/deliver (skip size exceeded): Some filters do not check mails larger than a configurable size. For example, spam mails are typically small, so the SpamAssassin filter by default passes large mails without checking. accept/deliver (junk): The filter found unwanted content, but the mail is accepted and delivered nonetheless. reject/deliver: The filter found unwanted content. Receipt of the mail is rejected with a configurable Mail Rejection Message. The message is still delivered to its recipients. Some filters (such as the SpamAssassin filter) tag the message, so they can be quarantined by the mail server using filtering rules. reject/redirect: The filter found unwanted content. Receipt of the mail is rejected. The MTA that connects to CleanMail is supposed to notify the user with a configurable Mail Rejection Message. The mail is redirected to a quarantine account you can configure. accept/redirect: The filter found unwanted content. The mail is accepted. The mail is redirected to a quarantine account you can configure. reject/delete: The filter found unwanted content. Receipt of the mail is rejected. The MTA that connects to CleanMail is supposed to notify the user with a configurable Mail Rejection Message. The mail is deleted. accept/delete: The filter found unwanted content. Receipt of the mail is acknowledged, but the mail is deleted. The mail simply vanishes, the sender is not notified, and the recipient never sees it. delete (unexpected client disconnect): The client disconnected without waiting for the mail server to acknowledge receipt of the message. The mail was probably spam, so good riddance. A legitimate sender will try to resend the message later. reject/delete (mail too large): The mail was larger than the message size limit you have configured. The message is rejected, and the MTA that connects to CleanMail is supposed to notify the user with a configurable Mail Rejection Message. "So far the most effective anti-spam tool we've used. It's also very light weight so it doesn't affect server performance." "We moved from GFI to CleanMail almost two year ago, and it does a great job at keeping the crap out of our inboxes. Used in conjunction with a custom Exchange IMF filter, I haven't had any more calls about spam problems. Easy to configure, easy to manage, and a great price." Read the CleanMail Server User Manual online. Read the CleanMail Home User Manual online. Get an overview of CleanMail Email Security Server. Read a detailed description of CleanMail's email security & antispam features. Take a look at some CleanMail screenshots. Find 3rd party tools in the contribution area. What's new in the latest version? Find out here.